Another very welcome and interesting contribution today, this time courtesy of rhetor (not his/her real name!! ), a resident of Toronto where I spent a very happy four months working on a a secondment back in 2007. I am a bit of a long time reader and fan of your blog, and have for many years enjoyed opening every evening’s new column and perusing its song sample. It is a delight, as a Torontonian, to see your unique far-off yet near to home perspective on the musical taste we all too often seem to share. And though you probably do not recall, I have even left the occasional comment or two, entered one of your contests (the draw for Morrissey’s Swords), and even contributed briefly a song and write-up that featured when you were away in Ireland after the death of your brother (the Beloved’s song “Found” from the album “Happiness”). Actually, as an unhappy anecdote, I must say that I once penned a whole column to contribute to a series you featured a long time ago, where readers wrote about “ten random songs from their iPod shuffle” and what they meant to them, but sadly, just as I clicked send, the laptop froze and I lost everything! I was so disheartened that it took quite the long time, though tempted often, to get around to trying another entry for your consideration and possible inclusion in a series. I als feel that it is a bit cheeky of me to contribute an entry to your Imaginary Album’s series for The Trashcan Sinatras, as I know that you are indeed a fan too, but also that others in your ken (such as Colin from Fivehungryjoes) are also super-fans, but as I saw that no one had yet tried this exercise of creating the definitive TCS album, and that the long-awaited sixth TCS album is being born in just a month or two, so it would be an ideal time for a bit of a retrospective. So, feel free to include, if you think it might fit, or not, if it is not quite what you see fitting in. But I do need to say that I love your daily entries, and you must promise never to stop writing, as you can see how much you mean to readers even far-off across the proverbial pond. For those not aware, the Trashcan Sinatras (formerly known as The Trash Can Sinatras) are soon to release (in September) their sixth studio album, which those who wish to support, I believe, can still do through the group’s Pledge Music campaign. An ideal time, then, to do a bit of a retrospective of the band in anticipation of the coming but long-awaited treat. As the opening track for the band’s debut album, and the debut single released prior to the album that introduced the band to the world, this is the obvious choice for album opener. Yes, I say world, because the song did very well not only at home in the band’s hometown of Irvine and environs, but also in the USA college radio circuits, and in my native city of Toronto, Canada, thanks to decently heavy airplay on my then-favourite and must-listen radio station CFNY, and the support of the very thoughtful and influential DJ Alan Cross (if you are not familiar with him in other parts of the world, fans of The Vinyl Villain and his musical tastes may well be interested in googling Alan Cross’s name to find the podcasts of his lengthy series The Ongoing History of New Music). Who else could write a song with a title alluding to a traffic-slowing barrier that then turns out to be ostensibly about North Sea fishing trawlers bringing home their catch, but in fact is more profoundly, as the lyrics tell, about “life and death”? This is the beautiful track that really makes the Weightlifting album (the band’s long-awaited “Comeback Album” after the bankruptcy that followed the collapse of Go! Discs and the end of their recording deal. I think many, many fans would have this on their list. The opening lines, “As fly to tarantula, as jugular to Dracula/ to me in my ford spectacular, you’ll be drawn…” give a feel for what the rest of the Happy Pocket album is like: a highly literate, but tongue-firmly-in-cheek ironic look at a variety of odd characters and personages both real (of the band’s ken) and very hopefully imaginary. Again, this is a song that is not likely to have made the cut of every TCS fan out there, but is a personal favourite that just had to make the cut. I had originally bought the band’s first album, Cake, as a whim upon seeing it in the music shop, as it had a sticker that claimed it was Scotland’s answer to The Smiths (?!) and as it was on the Go! Discs label that was a home for my other current favourites The La’s, Billy Bragg, The Housemartins, and The Beautiful South. I figured I could trust a label that was perspicacious enough to snap up such a collection of great artists, and it turned out to be a wise decision as I loved the album on first hearing, though I really never heard much of The Smiths in their sound. By the time the second album, ISE, was released I bought it the first day, and was equally impressed on first hearing, though by no track more immediately than The Hairy Years, which seemed to me to be so delicate in the beauty of its harmonies and child-like simplicity of lyrics that covered over some mysteriously dark content, that I recall being afraid to listen to the album too many times, for fear that the first impression would wear out and I might tire of that first feeling…Of course, I never did. No more need be said to convert casual friends to TCS fans than to quote a few selections of their lyrics. 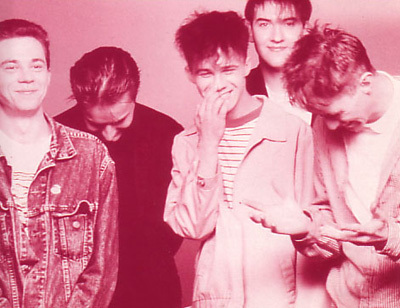 And there are few better or more frequently quoted than these (and looking at them, no wonder that plenty of fine bands overtly cite the Trashcan Sinatras and their lyrics as major influences, not least of which include The Lucksmiths (featured here recently) and the popular and rising Canadian indie band Stars). Another song that is not every fan’s favourite necessarily, and only ever saw light of day as a b-side, but happens to be my own personal TCS #1, so here it is. I was a genuine life-time highlight when they agreed to play it live in concert at my request, at a small venue in Toronto in 2011 as part of their “all- request private house party” concert series. Hidden Bonus: Astronomy (acoustic version taken from the band’s self-produced Radio Sessions: Volume 1, rather than the original Japanese-only bonus track from the Weightlifting album). Hayfever: This was the band’s second highest charting single, reaching the dizzying heights of #11 on the U.S. Modern Rock charts and a fine pop song it is too. The music video was reviewed somewhat favourably by Beavis and Butthead back in the day, despite their predictable juvenile mocking of the band’s accents! Ghosts of American Astronauts: As TCS began their career back in the mid-to-late ‘80’s as a covers band, it would have been nice to find space for this gem (a cover of a Mekons song which was never released but made its way to the very scarce CD Zebra of the Family, which the band released as a way to both clear their recording studio closets of some gems and skeletons that somehow never saw the light of day, as well as to raise some much needed funds to help record their fourth album, Weightlifting, after the awful spectre of bankruptcy followed the collapse of their record label, Go! Discs, and the end of their recording deal. Feel free to fire it over…..happy to feature a singer or band more than once!! Great choice for a TCS compilation! It’s very hard to only pick 10 tracks. Can’t wait to hear their next album.